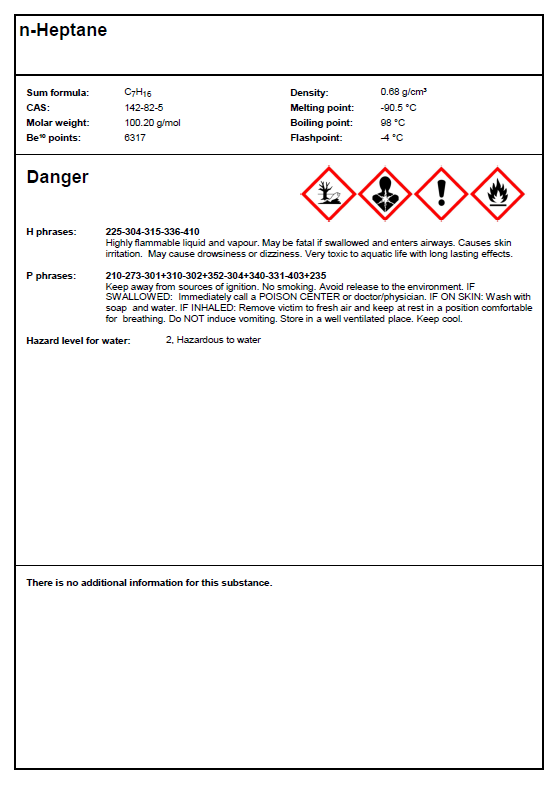 Beryllium¹º is a program designed to facilitate the creation of group safety data sheets (GSDSs) and single safety data sheets (SSDSs) for hazardous substances and processes. The created data sheets fulfill the conditions of EG Nr. 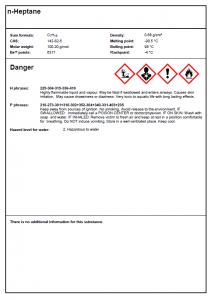 1272/2008 (Globally Harmonized System of Classification and Labelling of Chemicals, GHS) and §20 Gefahrenstoffverordnung (German regulation and version of European Union Directive 67/548/EEC: Safety advice concerning dangerous substances and preparations). Small, fast application. No installation necessary. Runs directly from an USB-flash drive or the like. Intuitive GUI allows fast customization of content. Safety data can be imported from various sources such as Wikipedia, Merck, GESTIS and an offline library. Hazard statements and precautionary statements (and risk and safety statements) are automatically collected and included. General statements are automatically included. Test it. It’s free and open-source! What are GSDSs und SSDSs? Below, two example data sheets are shown. 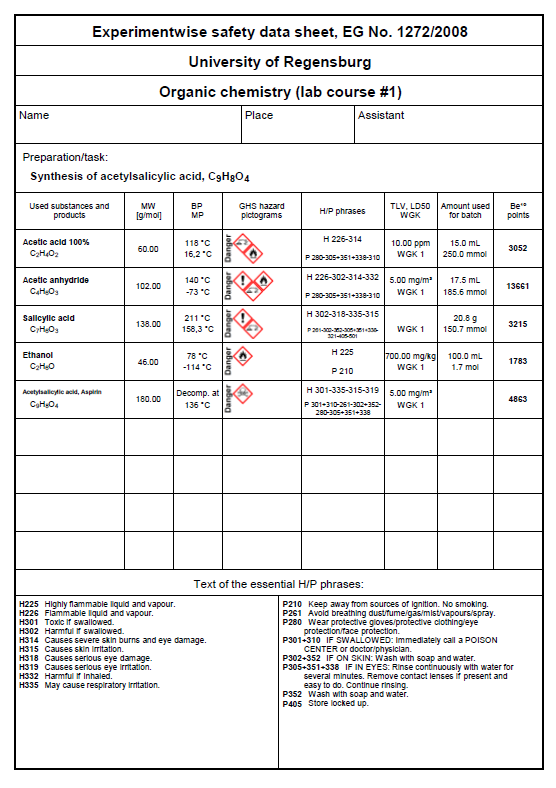 The first one is a group safety data sheet (GSDS) for the synthesis of acetylsalicylic acid. One not more than two pages all important information is compiled. 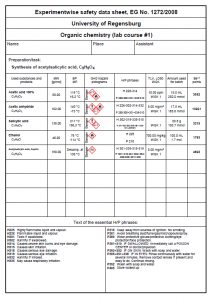 In contrast to the multi-page material safety data sheets (MSDSs) provided by vendors, the GSDSs provides a clear overview, which is always at hand during a task/synthesis. The second picture shows a single safety data sheet (SSDS) for n-heptane. These are useful for processes and places where a specific substance is used over and over again. For instant, n-heptane is a common solvent in HPLC. So, the SSDS could simply be put on the instrument itself for everyone to see. Download the following file and extract it into any directory. No installation necessary! The archive includes the binary for both Windows (beryllium10.exe) and Linux (uBeryllium10), and a small library of often used chemicals. Beryllium¹º was successfully tested on Windows XP and Windows 7, and on Knoppix 7.2, Ubuntu 12.04, Linux Mint 16 (Cinnamon), Slacko Puppy 5.6, and PCLinuxOS (12/2013, MATE Desktop). If the import of safety data from any source does not work properly, please provide the full name of the substance and the source you were using (or the direct link)! Thanks alot! Do you want to send me some feedback, critics or bug reports? Just fill out this form and click on „Send feedback“. It completely anonymous!